nullsecurity.org/articles - "crackmes.de : MaxXor's KeygenMe V6"
The information about it says that it is written in C, patches are forbidden, the only acceptable solution is keygen and the crackme is graded as level 2 (needs a little brain (or luck)). Good. First of all, I'll make a small observation. The file size is quite small, only 6.5KB, so it's most probably highly optimized (no debug information) or written with inline assembly routines, which should make my job easier. But lets take a closer look, by loading it into PE Explorer. There's some debug data in there at offset 0x678 and it's 0x6F bytes long. This is the PDB file information data, added here by the linker. From the string, we can see it's compiled from Visual Studio 2010, and where it was physically located on the author's PC. Also, something interesting is the DWORD before that string. It contains a counter, that will increment every time the executable is recreated by the linker. Anyways, let's move on to the more important things. 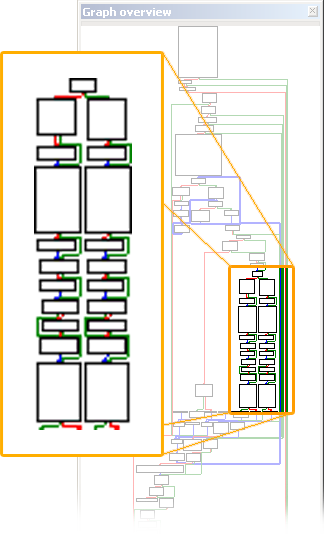 I've loaded the EXE in IDA to get a better look of the structure, and it turns out to be pretty simply written. There's a dialog process with few cases - create the GUI, some WM_COMMAND handling for the Register, About and Exit button and so on. Good. The check routine is written inside the dialog process, starting at 00401426 (I've split the code for clarity). Username should be 4 characters long, and Password should be 0x14 (20 chars long). In case they aren't, it jumps to 0040174A where nothing will happen. 00401453   . BE 30124000    MOV ESI,KeygenMe.00401230                              ;  ASCII "0123456789ABCDEFGHIJKLMNOPQRSTUVWXYZ"
That string contains the character set used in a valid serial. 004014DD   . 68 24124000    PUSH KeygenMe.00401224                     ; |Title = "KeygenMe V6"
004014E2   . 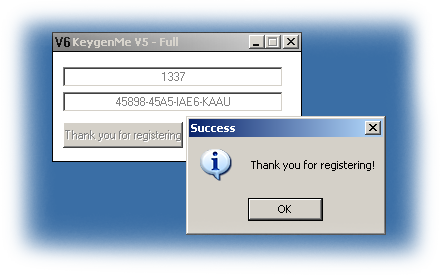 68 00124000    PUSH KeygenMe.00401200                     ; |Text = "Please enter a number as username!" Using the isdigit function, every character form the username is checked. In case the username doesn't contain numbers only, a "Please enter a number as username!" message will pop out. If everything is fine, the jump at 004014C5 (JNB SHORT KeygenMe.004014FC) will be taken, so the correct code flow continues from 004014FC. The username (all numeric) is converted from string to integer by the atoi function. A loop between 00401510 and 00401538 will fill an array of integers with some calculations made by IDIV and IMUL. The code from this point and below is the keygen routine and it's doing both calculations and verifications. In other words, the code will verify every calculated number against the entered user, instead of just calculating the whole correct serial and comparing it to the user's serial. From the code above, i can see that EBP-70 is the loop iterator that is INCed by 1 on every run, and when the iterator hits 0x14 bytes, the code flow jumps to the loop exit at 00401716. I don't know if that's intentional, to stretch out the code or just the compiler went "yeah, whatever" and did his job that way. At the beginning 00401551 address, the iterator is compared to 0, and if there's a match, the code flow jumps to 00401592. So, at the first run, the loop will skip the code inside, and on every next run it will execute it. Between 00401557 and 00401562, the iterator is modulo divided by 5, and if the condition is true, the code between 00401564 and 0040157D will execute. Something obvious is that SUB EAX,2D. 0x2D is the ASCII character "-", and the SUB;NEG;SBB;INC is a fancy way to "compare" it with the value [EBP+EAX-28] holds. I already know that EBP-28 is the user's entered serial number, and EAX (EBP-70) is the loop iterator, so what this code does is to check that every 5th character of the correct serial number is "-". I can now enter some username - 1337 and some faulty serial - 11111-2222-3333-4444 to start debugging from here. Here's what it seems to be a "is signed" check, but because EBP-70 is the iterator that is limited to 0x14 only, the DEC;OR;INC instructions should never be executed. The author maybe added (unsigned int) before the JNS? Anyway, the second TEST;JNZ is important. So, it will execute different code every time the loop runs. See how stretchy the code is? See the INC EAX/DEC EAX that I mentioned before. Yeah, anyway. C / pseudo codeuser_serial = "11111-2222-3333-4444"
// whoops, too bad! try again. However, there is a slight difference on that EBP-74 += 4; code, and it's depending on the result of i%2. So, let's write some test code! There. The code is ready, lets test it.